There are a lot of moving parts in business and sometimes when you are looking at a lot of pieces, it can be easy to lose sight of the main goal – clients. You may think that everything is built with your client in mind, and while I believe that’s everyone’s intent, it doesn’t always happen. When putting systems together, sometimes we think about budget or what we think will make things simpler, but that’s not always the customer experience. Understanding your customer’s journey and their specific experiences with your business is going to determine whether they stay in the sales cycle, whether it takes more time in the cycle or whether they just exit. Not only will understanding your client’s experience make buying from you easier, your business is able to benefit too. Some businesses work so hard at efficiency that they can forget about the client experience. While an automated calling system may be more efficient for you, if a future client can’t get to the person they are trying to reach, it may not be worth the cost of lost business. When making decisions about efficiency, ensure it won’t hurt the experience of future clients. When you understand the client experience, you get an outside perspective of something you and your colleagues see day in and day out. Clients can bring perspectives that your team can no longer see with their close familiarity. Often clients are the creators of ideas for new services and products that would be profitable for businesses if we listen to what they really need instead of what we think they need. Let’s face it, when the boss is around, employees can often put on their best show. Understanding your client experience better will help you understand what happens the majority of the time when the bosses aren’t around. Are they embracing your mission and vision or could they be the reason clients exit the buying cycle? Maybe all your team members are great representatives but the lapse between departments creates frustration for clients or a process you think is simple, doesn’t seem to be for them — whatever it is, understanding the client experience and their perception of it will help you close the gaps and retain more business. When you know your customer’s experience, you’ll also know what you’re doing well and what you are struggling with. This will also help you understand how you compare to your competition – what strengths you can present to prospect and what challenges you can work on. You’ll become more competitive and start to understand your ‘space’ better amongst other businesses. When you learn about the things that are going well. Could be improved or need to be ditched, you’ll also be able to see where investing your money will be able to improve the customer journey. Maybe you could move some of that marketing budget to sales training or ditch that automated service for a receptionist – it just depends on what works for your client. When you start reviewing and focusing on customer experience, your employees not only see the model, but also know that there are many eyes watching, not just the boss. They are often more motivated to perform better. With customer feedback, you also have solid reference points to touch base with their performance – good or bad. Don’t forget to celebrate as well as challenge. Not only have businesses acquired new business by understanding the client buying journey, they are also able to retain their current clients longer because the client experience improves all around and happy clients are loyal clients. 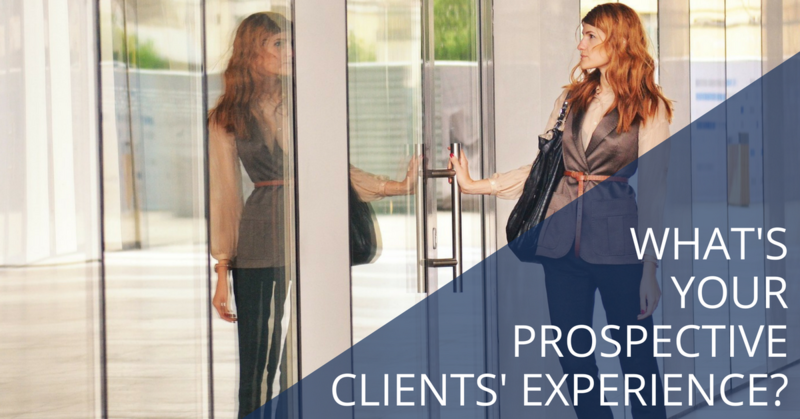 The client experience is the perspective that drives your business. If your business doesn’t cater to their experience and their needs, you might not be in business long. There are ways to get client feedback – surveys and incentives to report back on their experience. This is sometimes an easy ask for retail businesses, but with professional services, this sometimes happens less often or it just isn’t offering enough information that the business wants to know without exactly asking the client directly. You can learn more and I’m even offering some free reviews, check out more about the service and send me a message if you’d like a free review. Whether you get client feedback or use my service, I want you to go look at your systems and processes and try to imagine what your client sees. Get into their experience and it will offer awesome benefits in the way of growth. ⟵Are your beliefs sabotaging your leadership?